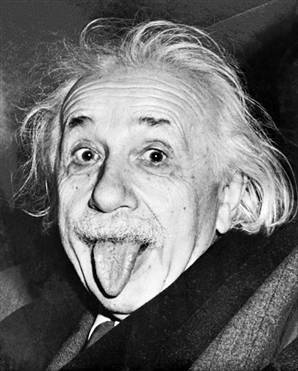 Known for being brilliant and for discovering the equation "E=MC2" Albert Einstein was a mathematician and physicist. Early in his career, Einstein saw discrepancies between the Newtonian Laws of Physics and the way magnetic fields work. This catapulted him into a profound search for answers, and Quantum Physics took a giant leap. There is a FAMOUS RUMOR that Einstein flunked math as a child. The best research says this ISN'T SO. According to a Time Magazine article, when Einstein learned of this rumor, he was amused and explained that in his early years he'd been working advanced math. History credits Einstein for creating the atom bomb, or at least the math theory behind it. This fact is ironic because he loved peace and because he was a Jew who had escaped Nazi Germany to come to the United States. Historians connect the invention of the atom bomb with the end of World War II and the Nazi regime. He changed the world with his math formulas, but he had yet to find the formula for happiness. TABLE + CHAIR + BOWL OF FRUIT + VIOLIN = HAPPINESS. That may have made him happy, but it doesn't cut it for me! 1901 Graduated with a physics degree from the Swiss Federal Polytechnic School in Zurich Switzerland. 1905 Obtained doctorate degree from University of Zurich. 1919 Married COUSIN Elsa Einstein Lowenthal. Oh. My. Word! 1921 Won the Nobel Prize for his discoveries in Theoretical Physics, actually received the award one year later. Odd facts: Einstein supported the World Government Movement and was asked to be President of Israel after WWII. Here's his Wiki page, and books about and by him.